Jenny will have some guests soon and she has prepared some snacks. But she has forgotten about her room which is a disaster. Jenny is a little messy and she didn’t have time to tidy up her room and now she is scared that her friends will come and see the chaos inside. 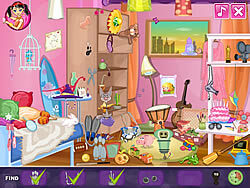 Help Jenny tidy up and find some missing objects. Good luck!